TOPPS is a company founded in Brooklyn, NY in 1938. It is associated with baseball trade cards (and also other sport cards). However, it started in the gum industry not much later, in 1947, with the brand “BAZOOKA” to compete with Fleer’s “Dubble bubble”. Bazooka became a common name for bubble gum and I still use it sometimes to refer to the cut&wrap format. They also commercialized bubble gum baseball cards. These are a flat sheet of pink gum printed with some figures on it. Coming back to the Bazooka, now this Division of Topps is called Bazooka Candy Brands and is specialist in “funny” candies/toys/seasonal products. I find all of them really interesting because move away from the traditional presentations and show a high level of innovation and “out-of-the-box” thinking. 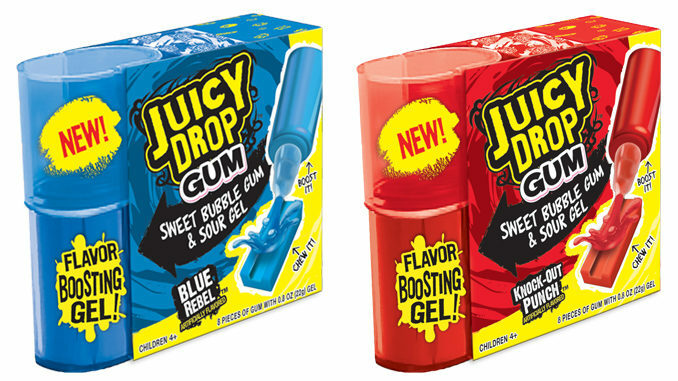 Some weeks ago, they launched the “Juicy Drop Gum”. This is a piece of cut&wrap (“Bazooka”!) which comes with a small bottle of sour gel. The idea is that the consumer (this is targeted to kids) pours some of this gel on the groove that the gum piece has on the top surface. Then it is chewed all together. Of course, this creates an explosive impact so it is intended for those looking for strong experiences (! ).